From New Recruit To Sales Director - In Only Ten Months! This month we congratulate our former candidate Jon Jordan on his amazing career trajectory. Jon rose from sales manager to sales director after only ten months at Troika Systems and his promotion is a great example of the Jackie Kerr approach to recruitment. Troika Systems are the market leader in quality control analysis management systems for the print industry and are based in Highworth. They design and develop a range of state-of-the-art quality control 3D measurement systems for their printer partners across the flexo, gravure, engraving and embossing industries and they recently received an innovation award at the Stationers' Company Innovation Excellence Awards 2016. In 2013, we were approached to find a new sales manager for this growing company. We made sure we understood their company ethos, the technical aspect of their products, their working environment and culture, and both their immediate plans and longer term aims. This made sure that we were fully prepared to select the most suitable candidates for interview and also how best to sell the value of the immediate and long-term opportunity to these potential new recruits. Whilst we found and interviewed a number of potential candidates who would be able to fill the vacancy and make sales, it was quickly apparent that Jon Jordan was not just a great sales person but was also a serious team player with the right career ambitions to help Troika increase their business within the printing industry. Jon Jordan comments: "As a successful sales person with strong sales and technical assets and the ability to see the whole picture when facing complex opportunities, I had a number of options in terms of where to take my talents. However, Jackie and her team really helped sell the opportunities at Troika Systems and I'm delighted to have spent the last two and a half years managing worldwide sales as their Sales Director." 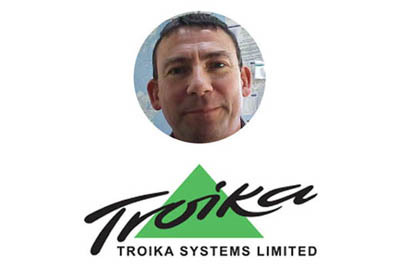 Phil Hall, managing director at Troika Systems, says: "As a company designing and developing forward-thinking and award-winning products for the printing industry, establishing and maintaining successful long-term relationships with our customers and partners is essential and Jon quickly made a significant impact in this area and continues to help the business grow from strength to strength." "Working with Jackie and her team was so straightforward. They really took the time to get to know us and to understand fully the best fit for our team and our industry. I look forward to working with Jackie again on the next phase of our growth plans." At Jackie Kerr, we are not simply looking to "fill a vacancy" but to introduce you to talented individuals who will help you grow your business and ensure your success with some quick wins but, more importantly, with a firm eye on your medium and longer term plans for prosperity.